PINPOINT II Oxygen Monitor� will quickly and accurately display a digital readout for dissolved oxygen in either % oxygen or ppm saturation. The measurement range is 00.0 � 20.0 ppm. This probe is a high performance polarographic type, which uses pre-loaded Teflon membrane caps and electrolyte fluid. This is the #1 preferred oxygen monitor in the aquaculture industry. The PINPOINT II Oxygen Monitor� is affordable, considering its high precision and ruggedness. 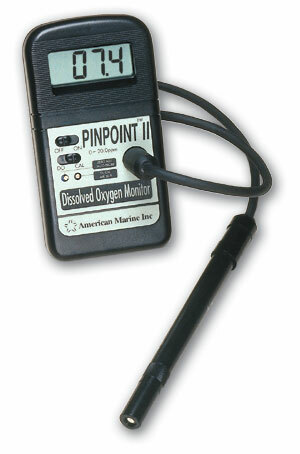 The PINPOINT II Oxygen Monitor� comes complete with Membrane caps and electrolyte fluid, probe with 5-foot cable and meter. Extra Membrane Cap/Fluid kits are available, and the 4-meter probe extension cord is an optional accessory. Given proper care, the PINPOINT II Oxygen Monitor� should last a lifetime. Competes with meters in the $700 range. Powered by a standard 9-volt battery (not included).